The famous Italian family restaurant Mamma Vittoria’s has sat on Smith Street long enough to see a lot of pretenders come and go, and with its rough-hewn stone walls, scattergun approach to art hanging and a soundtrack in the form of barely audible Italian ballads, it is plainly one that does not give a damn for culinary or decorative fads. Named for its owner, of whom a large painting takes pride of place on one wall, it serves traditional wood-fired pizzas, plates of fresh, heavy handmade pasta and hissing cast-iron platters of meat and seafood. The food is accompanied by a range of affordable Italian and Australian wines, most sold by the glass or the bottle. There is also a small selection of Italian desserts which few relatively diners probably get to sample, given the narcotic qualities of a large enough plate of spaghetti. Having shared a calzone, a plate of pasta and a bottle of chianti, your reviewers were virtually face-down in the homemade chilli oil. Sorry, Mamma. Mamma Vittoria is understandably proud of her baby. 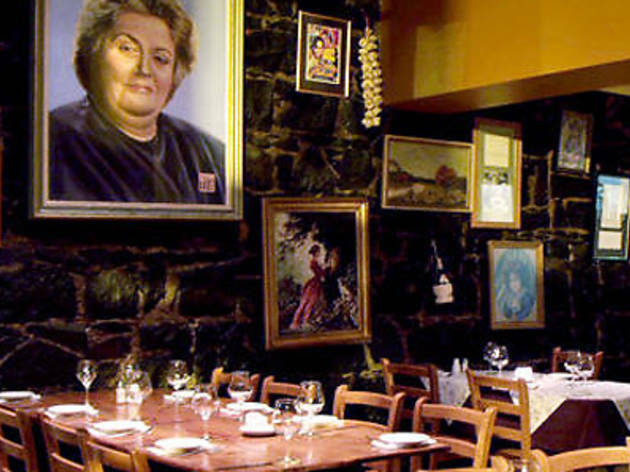 In fact, a few nights a week you’ll find the matriarch herself in the restaurant – if you’re lucky you may even find yourself sharing a table with her, trying to wheedle the secret to their famously excellent gnocchi con gorgonzola. You may not get the recipe that way, but Mamma’s does have a pasta cookbook for sale, in which you’re likely to pick up a worthwhile tip or two; directly across the road, Mamma’s brother runs a pasta shop (Pasta Classica, identifiable by the gigantic fork affixed to the front of the building) which sells fresh pasta you can cook at home. If even that sounds a little too involved, delivery and takeaways are available from Mamma’s. There is a popular function room for hire upstairs, a working fireplace and piano on the ground floor, and an all-around sense of good-fellowship. No wonder Mamma looks so pleased with herself in that painting.